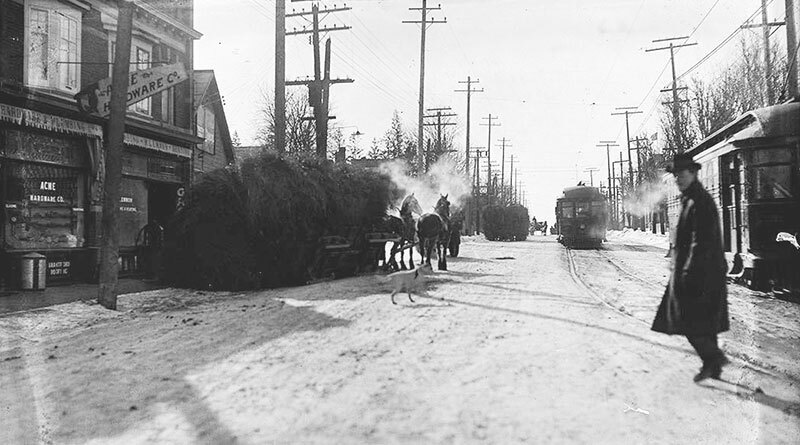 CITY OF TORONTO ARCHIVES/James Salmon Collection THEN: Horse-drawn hay wagons plod up Yonge Street north of Montgomery Avenue, alongside streetcars, pedestrians and canines in 1917. You may think Yonge Street traffic is hard to navigate now, but at least we don’t have to worry about getting around hay wagons. About a century ago, the street in North Toronto featured horse-drawn wagons and streetcars, not to mention pedestrians and at least one dog straying across, according to a city archive photo from February 12, 1917. The picture supposedly shows Yonge Street looking north at Montgomery Avenue, although you could not tell from the sparse and unfamiliar shops along the street. Today, of course, this midtown stretch is chockablock with retail and social service buildings, as seen in a recent photo. And traffic, lots of traffic. Hay wagons, however, have receded into history and transit vehicles are gone from this roadway, having been forced underground with the building of the Yonge Street subway line. We also note pedestrians — and dogs — seem to stick to the sidewalks and crosswalks these days. Alexei Malakhov/StreeterNOW: A different kind of traffic lines up at an completely changed intersection of Yonge Street and Montgomery Avenue.